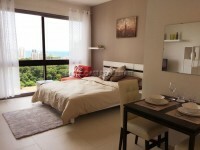 Pattaya Tower Condominium. This 41 sq.m. studio unit is located on 2nd floor in this building. The unit needs some renovation works before move in. Air-conditioning in living area. Big closet and balcony. The building provides a big communal swimming pool, security guard, and receptionist. This building is one of older buildings along Pattaya beach, it still proves very popular due to its excellent location, and relatively low cost per sq.m. It’s such a convenient central place to live, just 100 metres from Pattaya beach, and within easy walk to Central Festival shopping center, Big-C shopping center and all amenities, restaurants, and bars throughout the city too. Offered for SALE at its conditions at 2,950,000 Baht ONLY! !